A Blaze of Glory – California’s Native Grape! 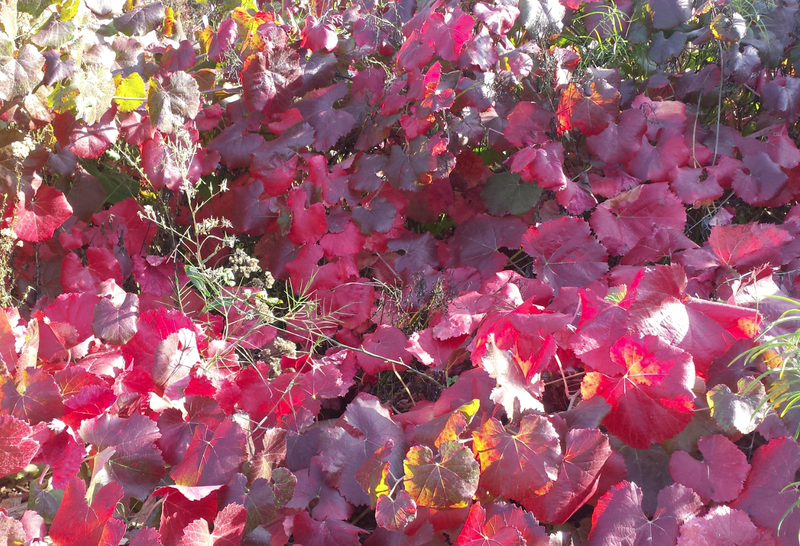 Nothing gets your attention quite like an array of California native grape vines (Vitis californica) in the Fall, once the cool weather has caused the green chlorophyll in the leaves to recede and reveal the brilliant red pigments hidden inside the leaves. This is especially true of the ‘Roger’s Red’ cultivar, which is actually a hybrid of the native grape with a European wine grape, Alicante bouschet (Vitis vinifera). This red wine grape has pigment not only in the skins, but also in the pulp of the berries, which results in an intensely dark juice. These pigments are called anthocyanins, and they do more than turn the leaves and resulting juice red. But more about that later. A Very Useful Native Plant Judith Larner relates this historical note: “California writer Mary Austin described moving as a young girl to southern California, where from homesickness she languished and fell ill, until she discovered some vibrant local populations of California wild grape. Gorging on the fruit, she ate her way back to vigorous health, while beginning to experience the essential feeling of connection with her new California home.” Just as we do with our modern grape varieties, the Native Americans used the grapes for juice, raisins and, so I’m told, wine. Reminiscent of our use of the leaves for making dolmas (the Greek dish consisting of vegetables wrapped inside grape leaves), the Indians used the leaves to wrap foods for roasting, and the stringy part for twine. The long, tough vines were an important basketry material in northern California, and were used to hold together the poles that formed the structure of their shelters. Cutting and pruning the vines to encourage their growth was an example of how the Native Americans mindfully tended the wild to support the needs of their community. Do Grapes Have a Place in My Garden? 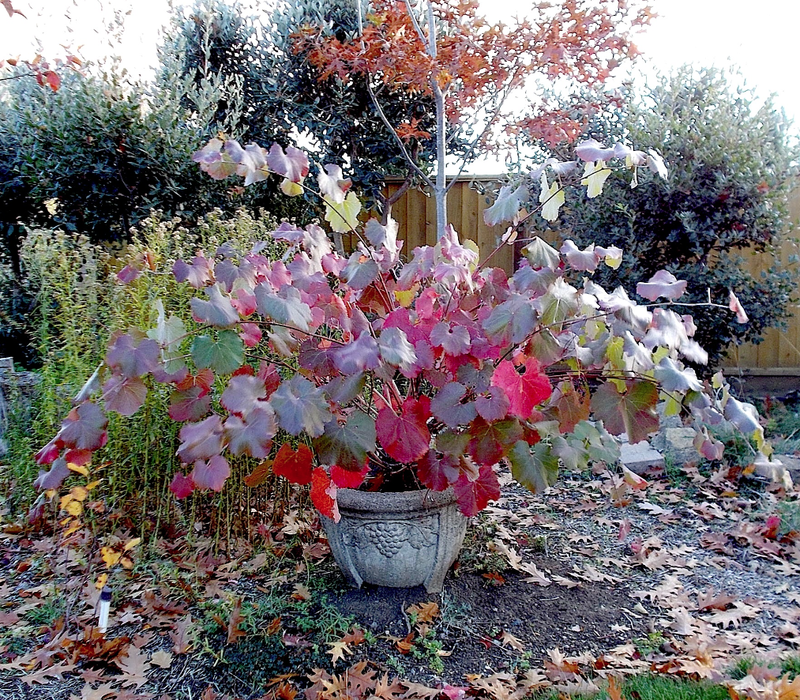 If you have a south-facing wall, arbor or a deck that needs to be shaded from the heat in the summer, but open to warmth and light during the winter, a native grape might be a good choice. The vines can grow as long as 60 feet, and can cover an arbor in just a few years. Allowed to sprawl over the ground, it makes a broad ground cover, attracts songbirds and stabilizes a slope. Or you can create a focal point of interest by confining it in a container and keeping it trimmed as necessary. And once established, it needs no summer water. But it comes with this warning: In nature, the vines readily wind their way up into trees. 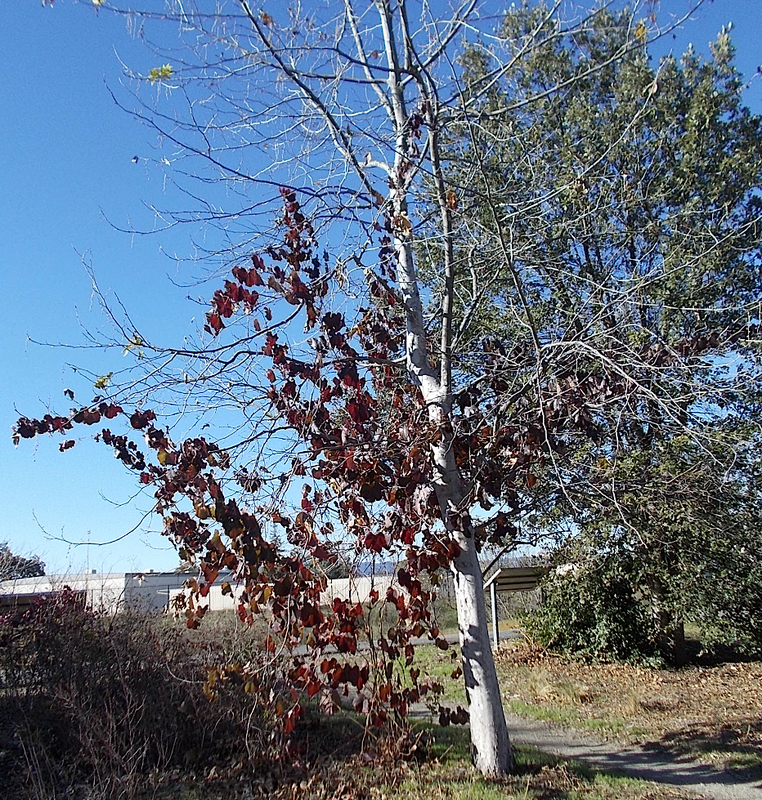 Untended over the years, they can grow 4-5 inches thick, strangling the tree or forming a canopy over the tree which shuts out sunlight and kills the tree. Grapes and Anthocyanins Mary Austin apparently didn’t mind that the native grapes are rather small and sour, especially if they are shaded from the sun during maturation by the large, attractive leaves. Whether or not Mary Austin’s recovery was due to the healthful properties of native grapes, red grapes are rich in pigment chemicals called anthocyanins. The healthful benefits of the anthocyanins are still subject to scientific confirmation, and there is some question about whether the anthocyanins act directly on the human body by way of our gastro- intestinal tract, or whether our saliva breaks down the anthocyanins into compounds which are more easily absorbed by the body than the anthocyanins directly. In any event, according to the National Institutes of Health, grapes and grape seeds have been shown to block the proliferation of some cancer cells. They may also “protect cardiovascular health by helping to prevent platelet aggregration, LDL oxidation, high blood cholesterol, reduce fatty streaks in the aorta, minimize inflammation, and prevent decreased blood flow to the brain.” They may also help combat Parkinson’s, Alzheimer’s and other neurodegenerative diseases. (In fact, fruit flies that were fed grape anthocyanins lived longer than other fruit flies!). That said, there are many different edible berries, not just grapes. Some might be better for providing health-promoting effects within the mouth, the colon or the nervous system. Berries are good food! 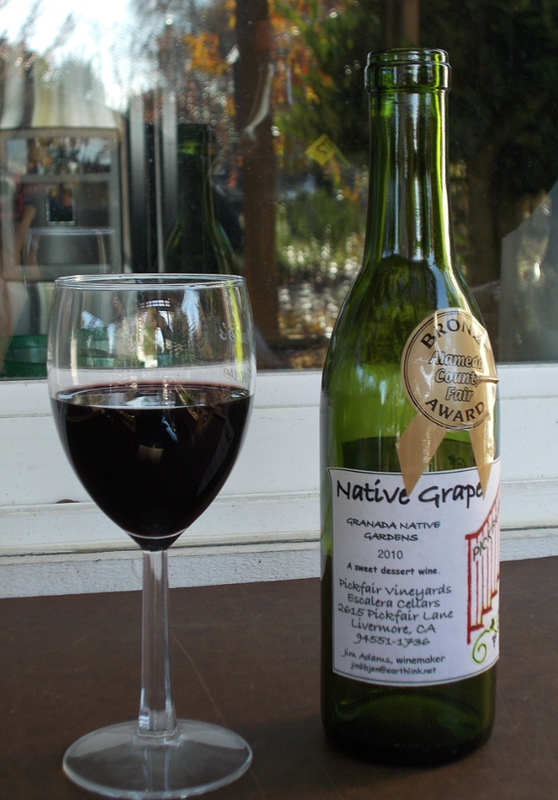 Native Grape Wine? It has been said that the native grape doesn’t make a very good wine. In my experience, this isn’t necessarily so, but the high acid level (typically about 1.4%) does need to be reduced to a palatable level (like, by 50%), both by making sure the grapes get enough sun and by carefully treating the wine with calcium carbonate to neutralize some of the acid. Winemaking is both a science and an art. In any case, as one California winemaker once said, “A little sugar can cover a multitude of faults.” In the 1850s, the phylloxera aphid was unwittingly introduced to Europe by English botanists who had brought native American grapes to the Continent. The immature aphids find their way into the roots of the vines, secreting a substance that prevents the roots from healing, and eventually killing the vines. Native American grapes had evolved resistance to phylloxera, but the European grapes did not have this resistance, and the aphid destroyed most of the vineyards for wine grapes in Europe, most notably in France. The industry was ultimately saved by grafting the European grapes onto native American rootstocks. Had native American rootstock not been available and used, it is said that there would be no wine industry in Europe. Other Native Grape Varieties A second cultivar of Vitis californica is the ‘Walker Ridge’. 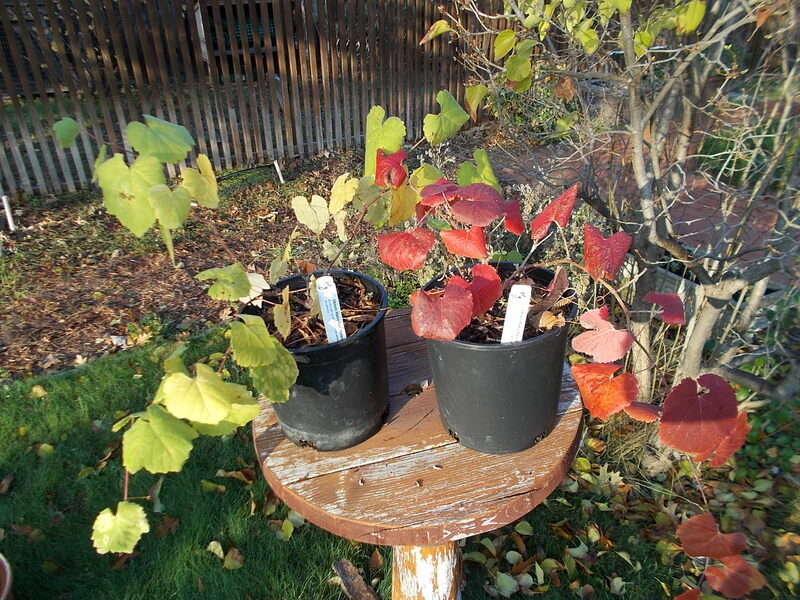 It grows less aggressively than ‘Roger’s Red’ (to 10 feet), has yellow to red fall-colored leaves, and is a good choice for a container or where space is limited. 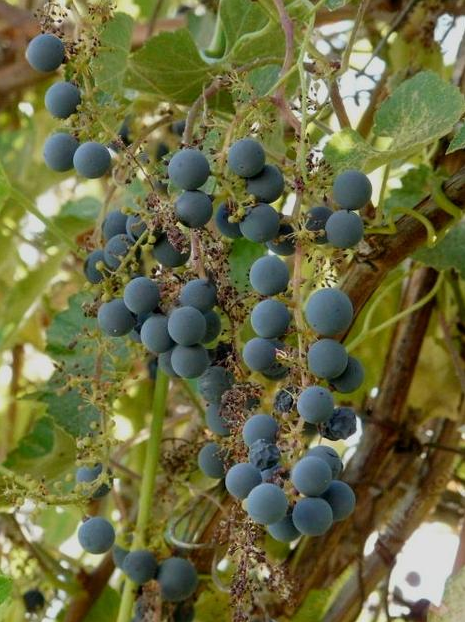 There is a second species of native California grape, Vitis girdiana, or “desert wild grape”. It is found primarily in the southern half of the state, has attractive pea-sized black grapes, grows very fast, tolerates high, dry temperatures, and is loved by bluebirds, thrashers and other berry-eating birds. Guided Tours of the Granada Native Garden Are Available! Are you interested in seeing some of the plants that are described in this Newsletter or in past issues? One or more staff of the GNG are routinely on duty at the Garden on Mondays and Thursdays, roughly between 10:00 AM and 12:00 noon. But it isn’t very hard to arrange a guided visit at other times. If you are interested in scheduling a visit, just email Jim at JIMatGNG@gmail.com . Or if you have any questions or inquiries, please email Jim at the same address!